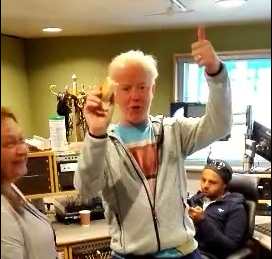 Chris eats one of our pies and gives it his famous "Woo Hoo !" and thumbs award approval. Russian Pie pioneer, Leeza Murina, meets Chris Evans in his BBC Radio 2 studio. 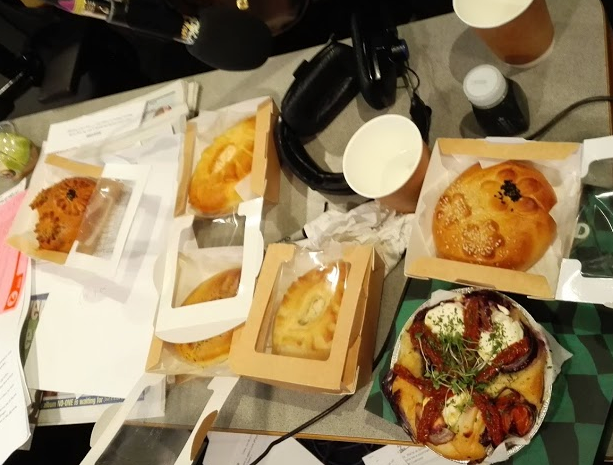 Listen to his verdict on our award-winning Chicken & Chorizo Piroshki. So off we went, me and my partner, Steve and the kids Rebecca and Clare. In brief, it was an incredible experience. We all got to be a part of the show by being allowed to be inside the actual studio from where Chris was broadcasting. Even our pies got to be inside the studio to - scattered all over the desks where the guests would pick a pie for themselves and munch them during their interview. Well not literally ! But in between questions, of course. After the show was over Leeza got to chat with Chris about how her pies were popular all of the country and how we have a enthusiastic band of customers who follow us from food even to food event - to which Chris likened Leeza to the Pied Piper (of Pies)! Afterwards we got great feedback about the taste and look of the pies from the various celebrities who were there - some of whom even took one or two of them home for dinner later that day. It was good to meet the array of stars - Rob Brydon, Rhys Ifans, Nicola Walker, Sanjeev Bhaskar and Years & Years.